Alright, Horror Fans; let’s finish what we started with Women in Horror Month 2013: In Their Words Part 1 with the second of our two-part look at some of the various women who are both creating horror media and supporting others who are doing the same. Read on…. My name is Chris Rickert. I’m the owner of Eljay’s Books in Dormont PA, a bookshop specializing in Horror, Sci-Fi and Fantasy. We offer 20% off used Horror titles every single Tuesday and host horror author signings year-round. We also have a fantastic selection of new Horror titles by local authors and small press authors from around the country. You definitely won’t be able to find most of these authors at your local chain bookstore! I also own Perfect Fish Designs, (www.perfectfishdesigns.com) where I crochet dolls, mostly bunnies modeled after classic monsters. 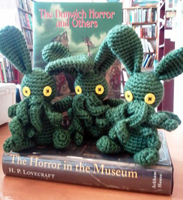 My most popular monsters are Zombunnies, Frankenstein’s Bunny, Vlad (a vampire bunny) and B’nnthulhu, which is based on HP Lovecraft’s tentacled monster. I’m always looking for new ways to present my little monsters and since I started designing I’ve added jewelry, finger puppets and key chains to the line. I’m always thinking about new monsters I can create. Coming up this year I’ll be creating some dolls for a stop-motion movie, designing some fantasy-based bunnies. I can’t say I have a favorite influence, I get ideas everywhere. I get some of my best ideas from older movies where the scares are implied or mainly psychological, because it’s hard to translate a CGI monster into crochet, but a lot of my ideas also come from books, or from photos and art other people have created. A lot of my best ideas have come from customers who ask for a certain monster as a doll. At the bookstore I certainly do have favorite authors and books: Joe Hill, Max Brooks, Sarah Langan and HP Lovecraft are authors I love to suggest to people just starting to read Horror. My bookshop is located in Dormont, right on West Liberty Ave. We have a website at www.eljaysusedbooks.com but the best place to keep up with us is on Facebook or on Twitter (@eljaysbooks). We update those sites daily and are often available to chat with customers. General questions can be emailed to eljaysbks@yahoo.com and questions about author events can be emailed to eljaysbks@gmail.com. My own work is for sale every day at Eljay’s Books and at both Horror Realm events every year. I also post pictures of new work and sell dolls and jewelry through www.perfectfishdesigns.com. My name is Laura D. Swinchock, from Washington, PA. I am married to Jason T Swinchock, who is the President/CEO of E-Nertia Global Entertainment, LLC. I am lucky to have a supportive husband who has included me in his ventures. In A Chemical Skyline, which was Enertia’s first horror film, I was the best 911 Operator in the business (joking). But in all seriousness, I was on set during the filming and helped with odd jobs such as working with the extras, make-up, and supporting the starring actors. From there, E-Nertia has created a Photography branch, featuring the E-Nertia Global Knockouts. I was able to assist in the early photo shoots with the models, as well as the editing. Through those small roles, I realized how much I missed being behind a camera. In high school, I first found my love for photography. Being able to tell a story and depict an emotion all behind the lens was so fascinating to me. Since then, E-Nertia has created E-Nertia Global Macabre which is a new photography branch. Each photo shoot depicts its own story with a dark twist. It is really my ‘baby,’ where I am able to express my artistic vision and provides me with the creative outlet I feel I have been missing. 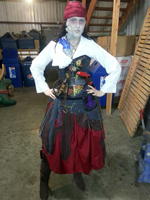 My name’s Amanda Luppe and I am a special make-up effects artist. I graduated from the Douglas Education Center’s Tom Savini Special Make-Up Effects Program in Monessen Pennsylvania in 2009. I live and work in the Pittsburgh area, working on films and plays. My first film was a small student short called Zombro where I designed a simple zombie make-up and created fake intestines for the actor to pretend to gnaw on (I do not recommend eating latex). After that I was a make-up artist on the zombie short, A Chemical Skyline. Around the same time I also worked on a super hero movie called Squidman. But my favorite job is working Kennywood’s Phantom Fright Nights, my local amusement park. There I can really stretch my creativity and design skills, and really it’s just a fun time! I have actors that have been coming to me to do their make-up for all four years, and when I ask them what they would like me to do, most of the time I have free reign. That can lead to all sorts of zombies and dead things. Fright Nights is actually the place where I perfected my signature zombie, which I used on a play at my old high school recently. The play was a spoof on Twilight, Resident Evil, The Walking Dead, and many others. The climax was pretty much a zombie killing fest. There were fake body parts flying and lots of blood! What more could a horror lover ask for? I’m not sure when exactly I caught the make-up bug, but I know I’ve always been a huge fan of movies. I used to sit there and watch these incredible sci-fi films and wonder how they did that. It mesmerized me! And ironic as it may be, horror films made me cringe for the longest time. Even when I started at the Savini School I was still scared of them. I was the walking conundrum. My favorite influence is Greg Nicotero, and while now I admire his horror work, I fell in love with his work on The Chronicles of Narnia: The Lion, The Witch, and the Wardrobe. And the day I got to meet Greg and have him review my portfolio, words cannot describe! It was the biggest honor, and while he was there to be a mentor to all of the fourth-semester students at school, it was still a special moment. My favorite story to tell from that day happened after he had reviewed my work. His studio, KNB Effects, is the one place I would love to work, so I got up the courage to ask for a business card so that I could send him my resume and samples of some of my work, but he told me that he had given out all of his new business cards. But instead of sending me away empty handed he told me to hold on because he thought he might have one of his old business cards in his bag. So he went over to look, and he pulled one out. He told me that he was telling everyone he was out and not to let anyone know he had given me this. I felt so honored and hopeful at that moment that I didn’t know what to say. That memory is probably one of the ones I hold most dear. While I’m still working on getting my website up and running, you can check out photos of some of my work from A Chemical Skyline on their Facebook page, or you can send me an email at amanda.Luppe@gmail.com. My name is Heather Taddy, I hail from Altoona/State College PA, and I’m currently residing in Pittsburgh. I was on A&E’s hit series Paranormal State for seasons 1 through 4. While studying Film and French at Penn State University, my longtime interest in the paranormal led me to join The Penn State Paranormal Research Society. To my surprise, A&E had been in the process of creating a reality/docu-drama, which would document cases investigated by the club. I attended the casting call and, lo and behold, a month later I found myself living out of a suitcase and being followed by giant television cameras. I traveled around the country exploring some of America’s most haunted locations, conducting experiments, doing historical research, helping and educating families, all while filming the madness. These days I am still doing paranormal related events and lectures. I’ve been asked to do a few other paranormal shows for other networks and have helped create a paranormal web series called Ghost Bait. The paranormal will always be an interest to me, but I’ve been focusing on more creative projects involving music, art and behind the scenes production. Regarding the paranormal, I’d have to say that my number one influence is clairvoyant/paranormal investigator Lorraine Warren. Warren and her husband, demonologist Ed Warren have investigated thousands of haunted cases all over the world for over 50 years. Several well-known books and movies have been made based on cases that they’ve investigated. In my early college years, I had the chance to attend one of Lorraine’s lectures and I’ll never forget how much of an impact it had on me. She discussed different types of hauntings, the dangers of the occult, and demonic possession, all while showing a slideshow of evidence from famous cases in history. She is an excellent speaker and hearing what she has seen and experienced in her lifetime will make your jaw drop. Never did I imagine that 2 years later I’d be working with her and hearing about the Amityville Horror investigation face to face. 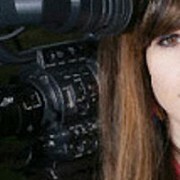 She’s an amazingly brave woman who has dedicated her life to helping others and finding answers to why hauntings occur. A&E and the BIO channel still air reruns and you can catch all seasons of Paranormal State on Netflix. Don’t be scared! I can be found on Facebook and Twitter (@Classictad). I can also be heard on Kettle Whistle Radio, which is a podcast that I do with David Fairhead that revolves around music, horror, and film. Episodes can be found at redhorseradio.com and on iTunes. 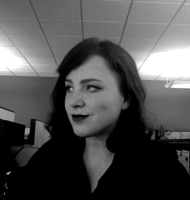 My name is Katelynn Pfeil – I’m from the Ohio Valley and am currently a graphic designer for Brunner, Inc. I guess that makes me sort of a different choice for WIHM, because I don’t actually work in an industry related to Horror but instead volunteer to support horror-related what-have-you around the Steel City. I’m not sure what the future holds for me but I am certainly looking to get more involved with the macabre in the community. Advertising is a demanding field, but the Horror genre is important enough to me to volunteer my free time to it. It first made an impact on me when I was a sheltered 9-year old who had just transferred out of Catholic school (space for inappropriate jokes). See, after making some public school friends, I went to my first real slumber party. Fittingly, the first horror film I ever saw was Rita Mae Brown’s parody/slasher Slumber Party Massacre. What struck me most about it was that though it was presented to me as something that wasn’t supposed to be taken seriously, I couldn’t take it simply at face value. It was more than a little silly, but it talked about a lot of things that until then were kept from me. I had a nebulous understanding that it was smarter than people were saying but it was part of a conversation that I didn’t have enough information to understand. But I wanted to understand. I clandestinely watched as many scary movies as I could for the remainder of my childhood. What I like most about the genre is not only has it historically been a sort of test lab for radical ideas, but it’s a conduit for subjects that are being repressed culturally. In my life, Horror has largely been about “what people don’t talk about”. That’s why I think it is so important. 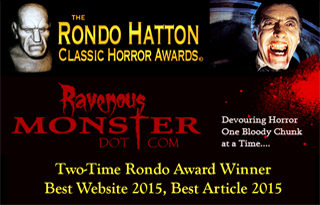 I’m hoping to see many new faces at the next Horror Realm convention and if you’d like, you can check out some of my work on this portfolio site which I negligently update. As you can see, each lady is taking her own steps towards enhancing the world of horror around us. Within my concluding remarks, I must say confess one fun fact that comes up with this article; I was so caught up in other projects and promotions that I shamefully nearly forgot about WIHM. Luckily, Mr. Thorson sent out an email about this special month, which caused me to realize and consider all of the productive women I know. As you can see from reading this, each individual has their own special type of work and I am proud to know of them. The excitement I felt while putting this together was certainly a constant. Some of us may ask, “Why do we need Women in Horror Month?” when we are working on projects all year long? It’s a good question to ponder. But for now, we can take advantage of this time to highlight these accomplishments, as choosing women for the article made me realize once again, in depth, just how talented they all are. While I could not fit everyone in this article, I cannot wait to meet many more artists in the future.